Adobe has released its Creative Suite 5.5, a year after the release of CS 5 (see earlier post). This is a new direction for Adobe, which typically releases major new versions of its CS line every couple of years, followed by interim updates to the individual tools. The other big change is the replacement of Soundbooth with the full Adobe Audition application for audio recording, editing, multitrack mixing, mastering, and sweetening with noise reduction and effects. The CS 5.5 Design and Web suites feature support for developing mobile and tablet applications that run on iPhone, iPad, Android devices and the BlackBerry Playbook, as well as new HTML5 support. And while Photoshop was not updated, CS5.5 supports building tablet applications that interact with Photoshop from Android, BlackBerry and iOS devices. Adobe has released demonstration iPad applications including Adobe Color Lava, Adobe Eazel, and Adobe Nav for Photoshop. For the Production suite, CS5 featured performance improvements from 64-bit support in Photoshop, Premiere Pro, and After Effects, plus the Mercury Playback Engine in Premiere Pro for GPU-accelerated real-time editing and playback (see earlier post). Besides the addition of Audition, CS 5.5 extends this GPU acceleration, and enhances file-based workflow for RED and other tapeless cameras and project exchange support for Final Cut Pro and Avid Pro Tools. After Effects adds powerful Warp Stabilizer, Camera Lens Blur and Light Falloff effects. Media Encoder also steps up to 64-bit, with background rendering and watch folders. The price for the suites and individual applications remains the same as CS 5, with upgrade pricing for previous versions of the suites or applications. But with CS 5.5, Adobe also is introducing subscription access to the CS suites and individual applications. This should be particularly useful for a short-term project, or a peak in staffing, or to try out to the latest version of the software. You can install the applications and use them month to month, paying for the specific software that you need, when you need them. A subscription for the entire Master Collection for $195 a month (or $129 with a one-year commitment), the Design or Web or Production suites for around $135 ($90) a month, or individual tools including Photoshop, Illustrator, InDesign, Flash Pro, Dreamweaver, After Effects, and Premiere Pro for around $35 - $50 ($50 - $75). Video editing for consumers is a tricky business, since the software needs to be easy to use for beginners, and yet have enough depth to allow enthusiasts to grow and experiment. There are simple tools to quickly trim clips and upload online, but if you want to make interesting and creative productions then you need something better -- a more complete interface with a traditional timeline to assemble and layer video and audio, apply interesting transitions and effects, and enhance with titles and animation. For example, Avid has updated its venerable Pinnacle Studio HD product line to version 15 (see earlier post), with expanded HD format support, performance optimizations, and bundled professional-quality content, starting at $59. That's an impressive collection of capabilities and technology, and should be enough to keep enthusiasts happy for quite a while. Yet consumer tools can cramp your style as you're being creative, especially with a fixed number of tracks and limited support for managing a growing collection of clips and assets. 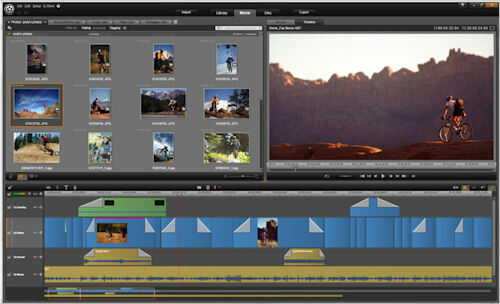 So Avid has introduced a new product, Avid Studio, which builds on the familiar and friendly look of Pinnacle Studio, but breaks through typical consumer limits to help organize your assets, correct and edit your clips, assemble layers on the unlimited timeline, and enhance with an extensive package of content and plug-ins. Yet this is still a consumer / enthusiast product, priced at $169, or as a $99 upgrade from Pinnacle Studio. Even in its first release, Avid Studio is a well-designed step up for advanced enthusiasts, breaking through the sometimes-frustrating limitations of consumer tools to help you be more creative with your productions. It extends the accessible Pinnacle Studio interface style to allow managing larger collections of media assets, more controlled editing of individual clips, and headroom for creative freedom. Plus, it includes an extensive collection of additional content and effects. 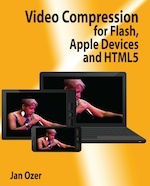 If you're making video and sharing it online or on iPhones / iPads / iPods then you need Jan Ozer's new book, Video Compression for Flash, Apple Devices and HTML5. Ozer is best known for his profusion of articles for magazines including PC Mag, Event DV, and Streaming Media, as well as his popular seminars at the Streaming Media Conference and other events (see earlier post). His expertise comes not only from shooting and producing video, but also from working with manufacturers for product evaluations and with application developers for in-depth reviews and comparisons, plus his ongoing surveys and analysis of how major sites are using video for streaming and download. And now Ozer has packaged up his experience and advice in his new book, chock full of detailed information and practical advice for getting the best video for today's most important distribution mediums: Apple iOS portable devices and H.264 Web streaming (just in time for the new HTML5 browsers). The book starts with an introduction to streaming production and encoding parameters. The next set of chapters focuses on H.264 encoding and production, with specifics for preparing material for Apple QuickTime, Adobe Flash, Microsoft Silverlight, and HTML5. The section on producing for iDevices and other mobile platforms then covers both video for download delivery via iTunes and for steaming over Wi-Fi or cellular. Next Ozer digs further into related issues for producing videos, including adaptive streaming (adjusting quality to the download bitrate without requiring a dedicated streaming server), choosing an encoding tool (for Mac and Windows), producing for related formats (Google WebM and VP6, and Microsoft Windows Media / WMV), and accelerating encoding on dedicated workstations. Finally, Ozer provides specific guidance on actually distributing your productions, both online through video hosting sites, and via live streaming. And there's a nice concluding chapter on useful video file analysis tools. Discussions of encoding options are made concrete with screenshots from a variety of encoding tools, side-by-side comparisons of video encoded with different parameters, and tables with details of options for different compression targets. Specific advice is grounded in the results of his encoding and playback testing, showing the real-word performance of different encoding resolutions and options on different platforms. Detailed recommendations are complemented with the results of his analysis of a variety of popular sites, showing how each has chosen to prepare video for different types of audiences. Video Compression for Flash, Apple Devices and HTML5 is available now for $29.95. Ozer is great about sharing his expertise and experience in his articles and seminars, and the book goes further to organize and expand what you need to know to make great-looking and efficiently-compressed video. It's a must-have for people concerned with sharing video to where the audience is, on iDevices and over the Web. You can find more about the book and Jan Ozer's writings online at his StreamingLearingCenter.com site, along with video tutorials, sample comparison images and videos, and information on his webinars, seminars, and consulting. Entries posted to Manifest Tech Blog in May 2011, listed from oldest to newest.